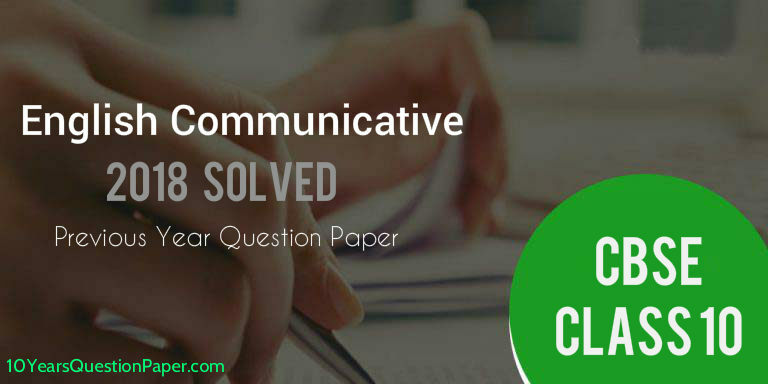 CBSE English Communicative Class 10 previous year solved paper 2018 – English language & English literature sample question paper in PDF for practice. English Communicative class X exam is being conducted in the month of March 2018. This solved English class 10 question paper you get to know types of question asked in the exam. These answer key will give an idea about the difficulty level of exam. This paper will help you in upcoming CBSE Exam. The English Communicative previous year papers 2018 class 10 can be downloaded in this post. Central Board of Secondary Education (C.B.S.E.). This exam is conducted in the base of NCERT syllabus – English language and English literature and you can get the very important question for class 10 from looking carefully to previous year papers. Download here and practice at home and school. The previous year sample question paper 2017-2018 and English Communicative question bank that have been issued by cbse.nic.in will help students upgrade your 2018-2019 examination result, if you students practice this English Communicative sample paper will give you the pattern of question paper, help students in time management in foundation of English exam, gives you actual exam environment in all aspects. So I recommend you to download the English Communicative previous year sample paper and practice this sample paper at home and school, the model answers are available in the attached sheet in PDF for all CBSE X students and teachers. This year CBSE has not made any changes in the exam pattern. Before you move forward, revise the CBSE English exam pattern. To know the expected question & previous years CBSE class 10 paper Visit the link below. After reading this solved English paper, if you have any question form your CBSE class 10 exam please share them in the comment below.